The final two days of All Access we were able to visit another Harbor Island that we hadn't been to this summer. The Island is Peddocks Island. 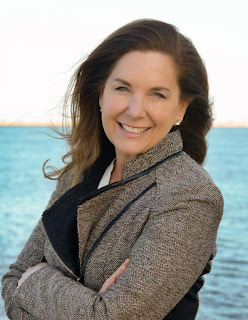 Peddocks Island is about seven minutes beyond Georges Island and very close to Hull Massachusetts. These trips started out just like every All Access trip where we met the groups at the Bank American Pavilion. 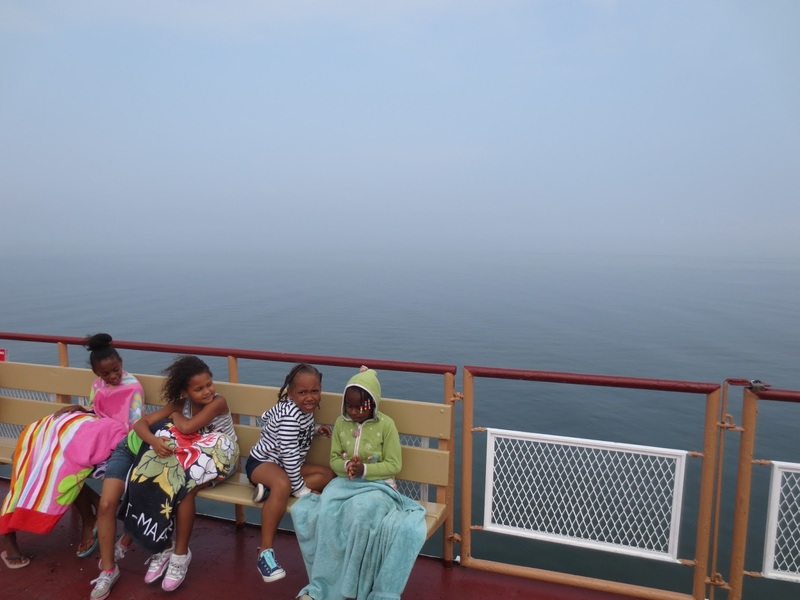 After all groups arrived we headed down to the Provincetown II but unlike other All Access trips we allowed families to take part in the two trips to Peddocks Island. 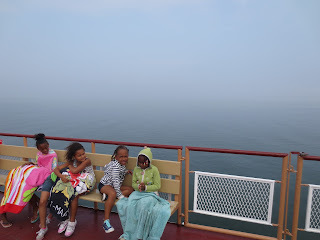 As we set off to Peddocks Island it was like any other normal boat ride except when we were passing Georges Island you couldn't see in front of you because of the thick and soupy fog. Due to the fog the Captain had to sound off the horn quite frequently just to make sure there were no other boats in the way. Once we arrived at Peddocks the first thing that caught my eye was the big open field and the three holes for frisbee golf. 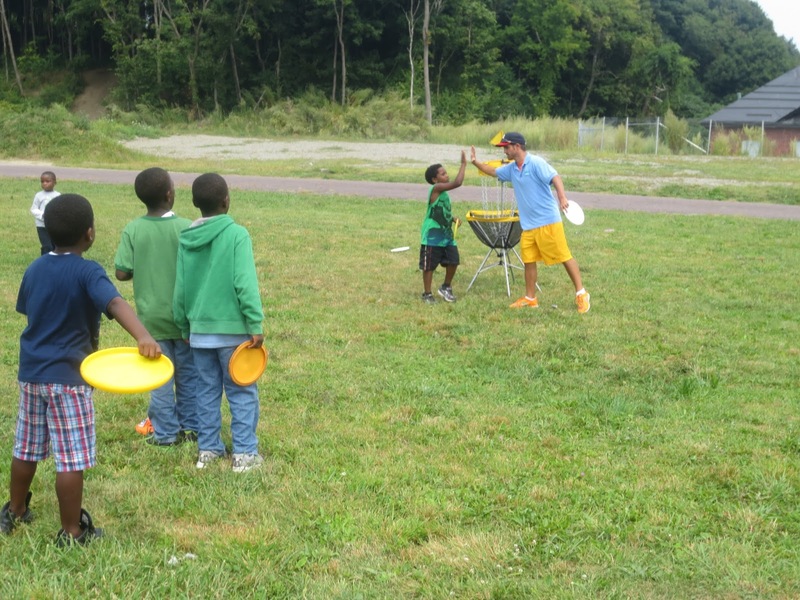 After eating lunch I played some rounds of frisbee golf with a group of the kids. Most of the kids never had played frisbee golf and some of them didn't know how to properly throw a frisbee. Before we started playing frisbee golf I taught the kids how to hold and throw a frisbee. Then I explained the rules of frisbee golf, followed by a few rounds of golf. One kid almost made a hole in one. It was an impressive throw to say the least. After playing frisbee golf the kids wanted to play a game of wiffle ball. Manny A and Mark brought a group of kids over to set up a game of wiffle ball. During our two days at Peddocks Island I was able to take a swim. The water was pretty chilly but I just couldn't pass up a chance to swim. My only regret was not being able to explore more of the Island and walk around to see the camp sites or other parts of the Island. I did enjoy being able to visit another Island. The Frisbee Golf was a blast!